Green thumbs not required. An intricately-designed watering system which saves you time and hassles! This ingenious gizmo simplifies plant maintenance for busy individuals. By looking at the monitoring gauge which looks very much like a thermometer, the markings on the scale indicate at once whether your plants need to be watered. If the red ball bearing falls to the minimum mark, it's time to feed your plants! It's also perfect for when you go on a holiday; the Plantplus system will keep your plants watered for at least two weeks. 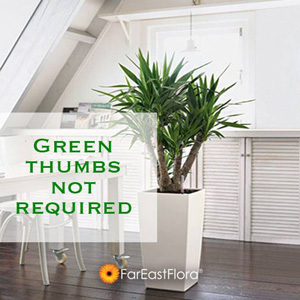 Plantplus series are available with most of the indoor plants of our collection that make it a perfect gift for loved ones, business associates and special occasions. Click for more info on Plantplus care!